When we consider global dysfunction, there’s the concept of the kinetic chain principle. Think of the five major load-bearing joints—feet, knees, hip, shoulders…head—but, really the ankles, knees, hips, shoulders and the cervical spine. Those are the five major kinetic chain checkpoints. If we have a restricted dorsiflexion on one side, the talus is sort of locked up; it’s not gliding posteriorly. That can throw off the pelvis position. We could have valgus movement on one side that could throw off the SI joint and cause excess rotation through the spine. We could develop a leg length discrepancy and create functional scoliosis, as it were. That’s possible. We could have restrictions, perhaps like a tennis player who has so much tonicity or hypertonicity in that right side or a baseball pitcher, with all the musculature emanating from the trunk and going out to the extremity…and out of balance. That’s completely plausible. We have to make sure we’re looking at the big picture first. I like to look at some sort of static postural assessment, and then move to transitional and dynamic. We’ll get to that as part of the second video. I kind of go whole—part—whole. I look at the big picture and then narrow it down to the smaller areas of local dysfunction, if any, and then come back out to make sure the “whole” is working right again. We also have the concept of the muscular slings. We have the obliques and the adductor complex working across the body, this spring mechanism concept as we go through the gait cycle of storing and releasing energy. If there’s an imbalance through there, whether it’s a muscular imbalance or an articular malalignment or a motor control issue, it’s going to throw off both gait and posture. There’s the posterior oblique subsystem, which is weak on most people, the backside—the glute and the opposite latissimus dorsi—pulling through the thoracolumbar fascia. If someone has a tight shoulder, there will probably be dysfunction in the opposite hip. This is going to produce a cascading series of events, whether it’s in the anterior or the posterior oblique subsystem. There could be a problem in the lateral subsystem where the adductor, quadratus lumborum and glute medius are working together to create frontal plane stability. For the person who sits with legs crossed or has had an ankle sprain creating an inhibited gluteal complex on one side, that’s going to throw the subsystem off. It could be in a deep longitudinal subsystem. If someone’s hamstring is really tight and the peroneals are potentially eccentrically lengthened and fibrotic because of past ankle sprains, it’s not going to have the same proprioceptive capabilities to transmit information, as well as force reduction and absorption through the upper body. We have muscular systems working together and if any those are out of whack, we might need to address those first. That’s why a kinetic chain assessment or a full-body picture is important. Don’t go just after the thoracic spine because that’s a popular region right now. You have to take a big picture approach and narrow in on the local dysfunction, but come back out to the global to make sure those changes have been made. You need to ensure there’s uptake or integration of any changes that have occurred during your sessions. 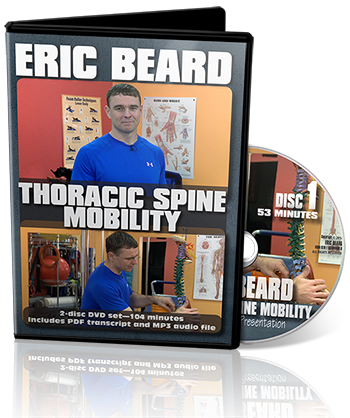 This was excerpted from Eric Beard’s Thoracic Spine Mobility video, disc one.